FGCU is the first university in Florida to join the Real Food Challenge, a student-led program designed to draw FGCU’s food budget away from corporate farming and junk food and, instead, direct it toward providing local, farm-fresh, ecologically-sound food. The Real Food Challenge is a student-grown movement that began to take form in 2008 but took full affect in April 2016 when FGCU agreed to take part in the movement by agreeing to make 20 percent of on-campus food “real food” by the year 2020. When FGCU made the transition in food providers from Aramark to Chartwells, one of the biggest deciders in the change was that Chartwells fully supported the Real Food Challenge initiative. Enter Ashley Farquhar, a Chartwells employee and recent FGCU graduate. Farquhar oversees three student interns who she says will be the real driving factor in the way the Real Food Challenge works. One of those interns, Cameron Cole, is the current president of the Food Forest and hopes that the Real Food Challenge will be able to partner with the Food Foresters. “We’re not quite certain about (how we’ll partner with the Food Forest) right now … but just off the top of my head, I was talking to the chef about getting an herb garden started specifically for SoVi,” Cole said. However, the issue in partnering with the Food Forest is that funds for maintaining and building the Food Forest are already included in each student’s tuition, meaning that if the school charges students for food made from the Food Forest, students will be charged twice for the same food. The Food Forest would also need to go through the same vendor standards and acceptance process that the rest of the on-campus food vendors are subjected to. There are other campuses across the country that have partnered with their food vendors and the Real Food Challenge to use resources they already have on campus. As far as the future goes, Cole said that the Food Forest is hoping to expand to a large plot of land in Buckingham, Florida within the next few years. “(If we’re approved), we’ll have 15 acres, which is 30 times the size of the current Food Forest,” Cole said. 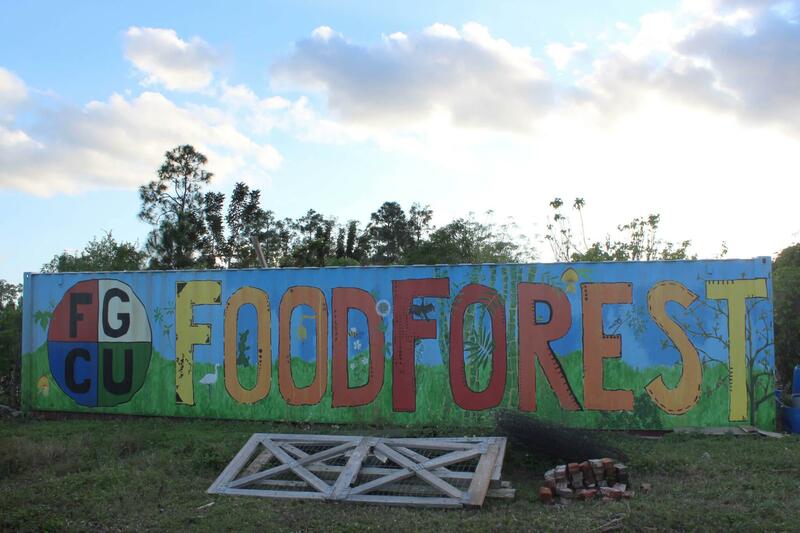 Currently, the Food Forest provides a variety of tropical foods that some FGCU students may not be used to. Cole said American avocado and mango both grow very well in the Florida climate. The Real Food Challenge has already held one farmers market in SoVi to provide food for students while also educating them on how to store and cook these unfamiliar foods. It plans to hold more throughout the year to teach students about health and wellness and what “real food” really looks like. Sarajane Sullivan is a junior majoring in journalism and possibly minoring in musical theater. She’s not sure yet, but she’ll let you know when she is. She just wants to watch John Oliver clips on YouTube and eat white cheddar Cheez-Its in peace. She started performing in and writing one-act plays when she was six, and would have her mom check them for any grammar errors. Now, she pays it forward by checking the grammar of all the Eagle News writers.